Spanning the Holston River approximately 15 miles from Knoxville, the 1600-foot-long Strawberry Plains Bridge was crucial to railroad transportation through East Tennessee during the Civil War. It escaped burning on the night of November 8, 1861, when five of the nine bridges in the area were destroyed. Led by Union Colonel William P. Sanders, a band of mounted infantrymen would eventually burn the bridge in June 1863, disrupting Confederate supply lines in advance of the Army of the Ohio's move into East Tennessee. 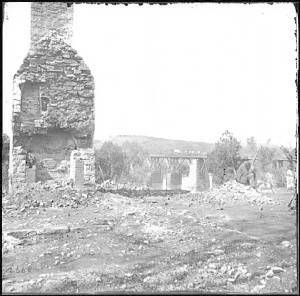 (About the Photograph) Introduction: A George N. Barnard photograph showing the railroad bridge over the Holston River at Strawberry Plains, Tennessee, with a Union sentry on the right, ruins of a house on the left, and a fort in the background. Title: Knoxville, Tenn., vicinity. Military bridge at Strawberry Plains and a fort in the distance, seen from north bank of the Holston. Date Created / Published: March 1864. Barnard, George N., 1819-1902, photographer. Summary: Photograph of the War in the West. 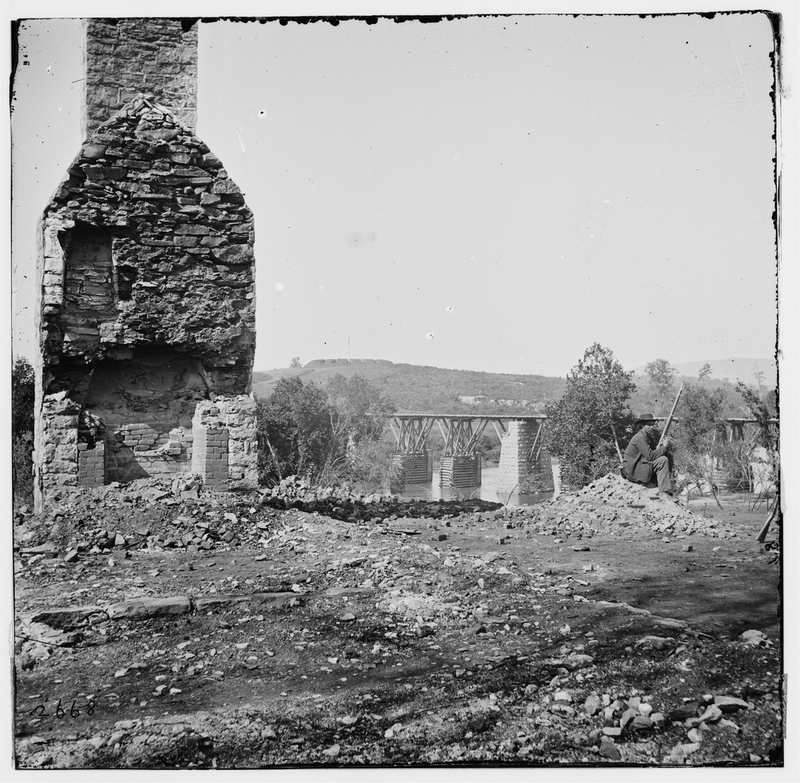 These photographs are of the Siege of Knoxville, November-December 1863. The difficult strategic situation of the Federal armies after Chickamauga enabled Bragg to detach a force under Longstreet which aimed to drive Burnside out of East Tennessee and did shut him up in Knoxville, which he defended successfully. These views, taken after Longstreet's withdrawal on December 3, include one of Strawberry Plains, which was on his line of retreat. Here we have part of an army record; Barnard was photographer of the chief engineer's office, Military Division of the Mississippi, and his views were transmitted with the report of the chief engineer of Burnside's army, April 11, 1864. Reproduction Number: LC-DIG-cwpb-02145 (digital file from original neg. of left half) LC-DIG-cwpb-02146 (digital file from original neg. of right half) LC-B8171-2668 (b&w film neg.). Source: Library of Congress. Notes: Unretouched photograph was scanned for highest resolution at LOC by webmaster. It is perhaps the highest resolution of the event now available online. While guarding what was considered the most important bridge in East Tennessee, Confederate Private James Keelan (also spelled Keeling) found himself in a life and death fight as he engaged and repulsed a contingent of determined bridge burners. Under a plan presented to President Lincoln by Union Generals William Sherman and George Thomas, the nine bridges of East Tennessee would simultaneously be burned during the guise of night on November 8, 1861. As five bridges were destroyed by Unionists, known as bridge burners, four escaped the fate. Private James Keelan, Thomas' Legion, was 15 miles from Knoxville and guarding the mammoth 1,600-foot Strawberry Plains Bridge on November 8, 1861, where he single-handedly met, fought, and repulsed the determined saboteurs. Although Keelan was seriously wounded during the melee, the superstructure continued to span handsomely across the splendid Holston River on the morning of the 9th. Keelan was posthumously awarded the rare Confederate Medal of Honor. 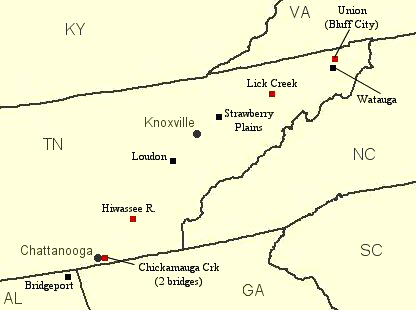 (About) The nine bridges of East Tennessee targeted by the bridge burners on the night of November 8, 1861. The red squares indicate bridges that were successfully destroyed. Whereas the 1,600-foot Strawberry Plains Bridge stretched beyond the width of the Holston River, it would be destroyed on June 20, 1863. Because the bridge was the only structure supporting the rail lines for the area, it was considered the most important bridge in East Tennessee, making it a priority target for Union forces. It exchanged betwixt the Union and Confederacy several times as one side would destroy it and the other rebuilt it. In Official Records of the Union and Confederate Armies, 23, I, p. 388, referring to the Strawberry Pains Bridge, Union Colonel William P. Sanders, Army of the Ohio, reported that his army had "destroyed the splendid bridge over the Holston River, over 1,600 feet long, built on eleven piers. The trestle-work included, this bridge was 2,100 feet in length." Once destroyed, fellow General Ambrose Burnside, a United States Military Academy graduate, pleasurably stated that “It will take months to rebuild it." (Official Records of the Union and Confederate Armies, 23, I, 385.) See also Tennessee and American Civil War Railroads. (About) High resolution photo of sentry at Strawberry Plains Bridge. This photo is a close-up, cropped of course, of the Union guard as seen in the above photo. He is armed with the Springfield Model 1861 rifle-musket, the most widely circulated Union firearm of the time. Although slow to load with a rate-of-fire of 2 to 3 rounds per minute, this rifle, in the hands of an experienced soldier, could be effective to beyond 400 yards, or the length of 4 football fields. Another reason for the rifle being preferred while guarding bridges and depots, was that its effective range could pin down a raiding party while allowing nearby reinforcements to arrive. 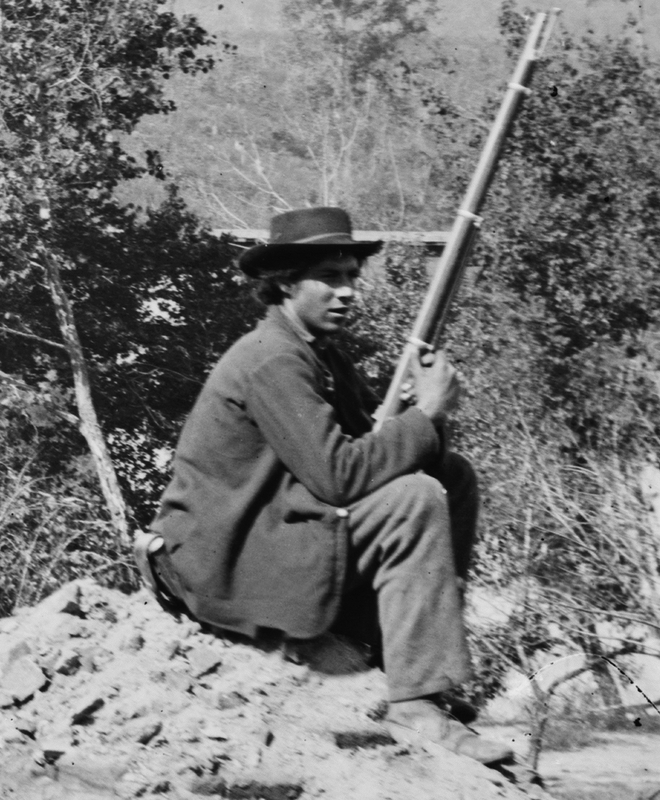 The Confederate counterpart was armed with the Enfield Pattern 1853 rifle-musket, which was similar to the Model 1861 in both range and rate-of-fire. Photo scanned at LOC by webmaster and is believed to be the highest resolution of the sentry found anywhere online. See also Civil War Weapons. Inevitably the stage was set and on a cold Friday night, November 8, 1861, the Unionists proceeded with plans to burn the key railroad bridges of East Tennessee; President Abraham Lincoln had approved the plan. This thoroughly researched, easy-to-read narrative tells the incredible true story of the people and events in the ‘insurrection gone wrong’.